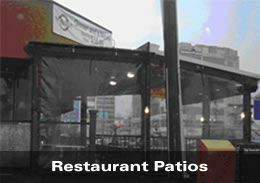 Stripcurtains.com offers clear patio curtains & awnings in a variety of colors and configurations. Patio curtains are typically manufactured using 18 gauge industrial grade pvc materials and often include an opaque top, side and bottom trims for reinforcement. 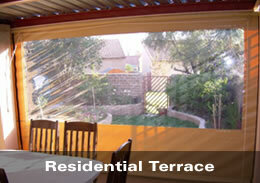 Patio curtains are ideal in keeping the rain, wind out while controlling temperature. Curtains can be fabricated with grommets all around or with grommets on top and side and a weighted bottom pocket for stability in stronger wind conditions. Track and trolley hardware is also available. Curtains can also be hung with s-clips and slotted angle or just wire rope and turnbuckles. 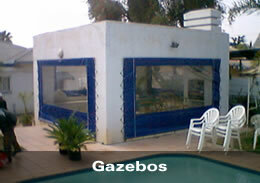 Materials are most commonly heat welded to each other thus providing superior strength and durability. 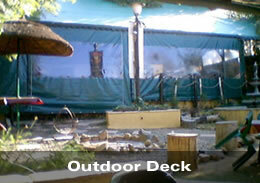 Materials can also be cleaned and scrubbed as required. Many colors and layout designs are available.